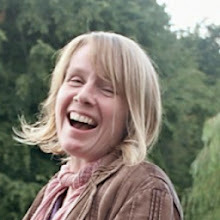 “What would you like to do for your birthday this year?” I asked my daughter nervously, knowing that at 12 years old, it was unlikely to be as simple as Pass the Parcel and jam sandwiches. "Erm…okay...Let me have a think about how that might work,” I said. My daughter is obsessed with the Murder Most Unladylike books by Robin Stevens, so I shouldn't have been surprised. Gradually, gradually, I started to piece together how it could be done. In fact, I started to get quite excited. A venue was chosen. Clues and characters created. Wigs, moustaches – and crime scene tape! – ordered. Invitations made and sent out. 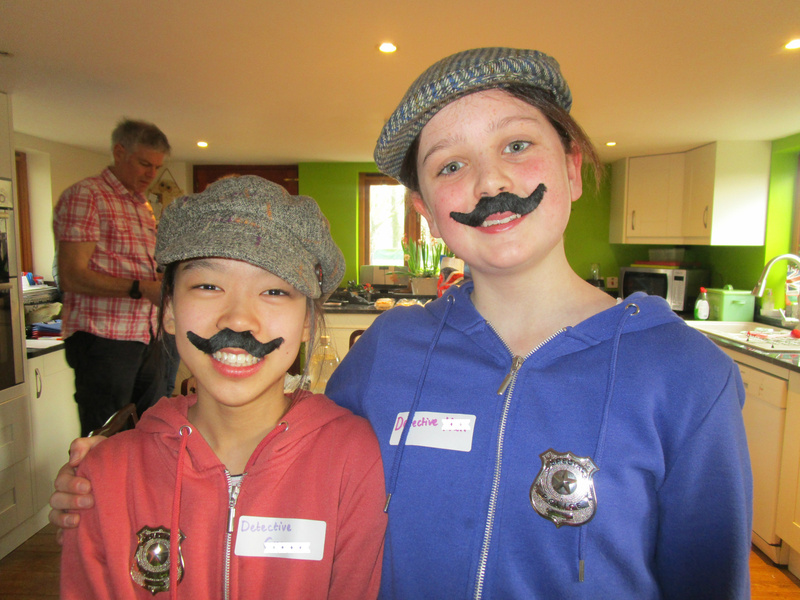 My daughter and her friend (they wanted a joint birthday party) were the detectives – and in charge of proceedings. As each of the 13 guests arrived, they greeted them with a package. It contained their character's name, description and disguise – to be put on straight away. Once wigged up, they were asked to introduce themselves with their new identity! 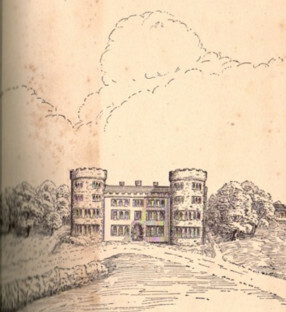 The detectives then explained the very serious matter at hand: The body of Lord Dalton had been found in the woods of Thurnham Hall yesterday. They had been hard at work on the case already and calculated that EACH AND EVERY SINGLE PERSON INVITED HERE TODAY HAD A MOTIVE TO KILL HIM! THIS MADE ALL OF THEM SUSPECTS! Their job today was to help them identify who the murderer was by hunting for clues that the murderer dropped as he or she ran away from the crime scene. Each clue would eliminate one of the suspects until only one person was left – THE MURDERER! And at that point they gave each guest a clipboard with this sheet on it so they could cross off each suspect as they were eliminated. “But first, let’s go take a look at the victim!" said the detectives and off they set! 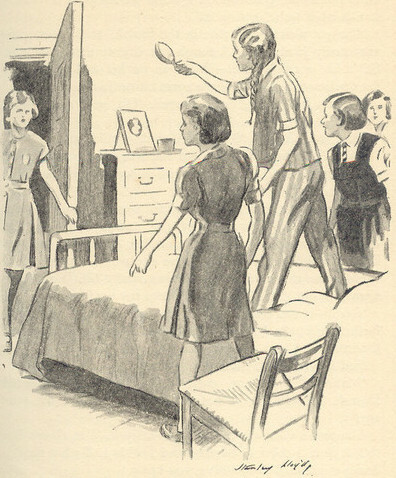 The girls gasped as the bloodied sheet was lifted to reveal the murdered body of Lord Dalton (aka big brother of daughter's friend, lying impressively still!). They then revealed the murder weapon, a large kitchen knife covered in blood (aka a knife from our kitchen with some red poster paint on it). “Now, let’s go find those clues the murderer dropped, shall we?” said the detectives, leading them deeper into the woods and through the grounds to specific areas (where 12 clues had been planted by us earlier!). Clue #1 is found: A half-eaten ham sandwich. Now who did that rule out? Goldie Goldberg the Jewish person who doesn't eat pork of course! Clue #2: A badly spelt shopping list? That eliminated Ella Scrabble, the English Language professor! Clue #3: A smashed watch stuck at 3.15? Well then, the murderer couldn't be Polly Splosh, the Olympic swimmer, who trains from 1.30 to 5.30 every single day! It seems they have new information: They have found evidence of a struggle between the victim and the murderer and a dark hair has been found under the fingernails of Lord Dalton. "What are the implications of this?" asked the detectives. Well of course, it must mean that all suspects with blond hair (wigs!) are ruled out. "Oh and by the way," added the detectives, "You see the gravedigger over there?" (aka other dad!). "It might be worth asking if he saw anything yesterday." "Ummmm...yesterday you say?...Let me think," he says in his best rural burr. "No, no, I didn't see anything untoward...oh, but hang on a minute...I did find this!" and from his pocket he produces a dangly earring. Aha! So the murderer, they now know, is a female! They just need to find the final clue. What??? Eh??? That just didn't make sense! There are no female suspects left whose name begins with E. A lot of head-scratching and discussion ensues. Then one of them works it out. "Got it!" she says, "Lizzie is short for Elizabeth!" And the murderer is revealed! It's Lizzie Riding, the horse-mad, show-jumping, fox-hunting woman who has a horse called Red Rum (which, incidentally, just happens to be murder backwards!). The murderer is led back home and hand-cuffed. And all that's left to do is eat birthday cake! If you like this, you might like Phone hacking, manslaughter or murder, madam? 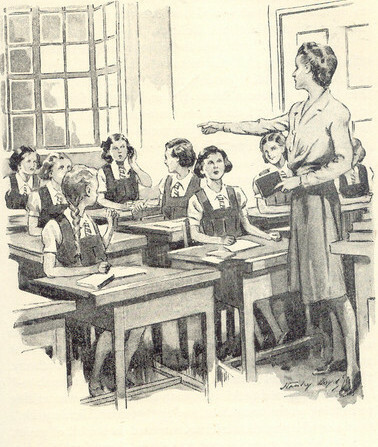 The real Malory Towers experience: Take your child to boarding school! "You have to dress up posh too, mummy," says my daughter, half stern, half playful. "Or we'll never get away with it!" Saturday morning and me and my 11-year-old daughter are going undercover. 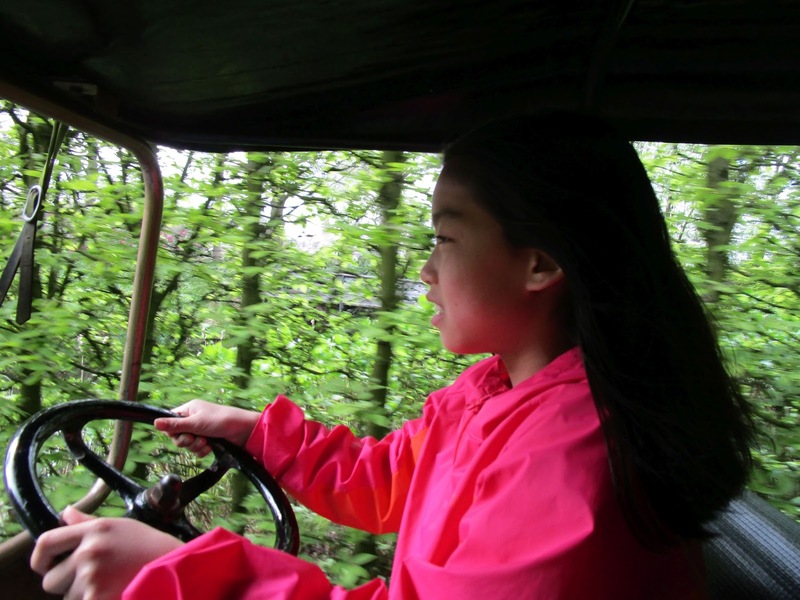 We're going to the most expensive girls' boarding school in Britain (£37,275 a year to be exact) for their Open Day – as a pretend prospective pupil and parent. 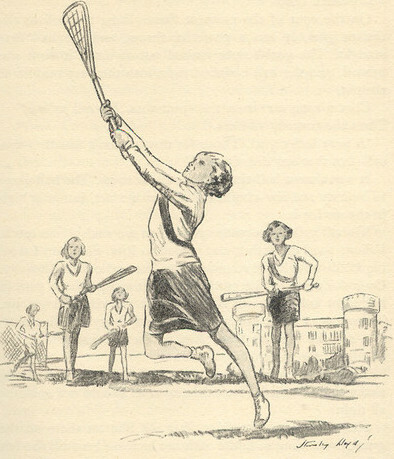 My bog-standard-state-school educated daughter has devoured Enid Blyton's Malory Towers series – just as I did when I was a kid – and her head is filled with a fantasy life of midnight feasts and hockey sticks. Wouldn't it be fun – and a tiny bit mischievous – to see inside that world for real? We're a little nervous (do we have the acting abilities to pull it off? 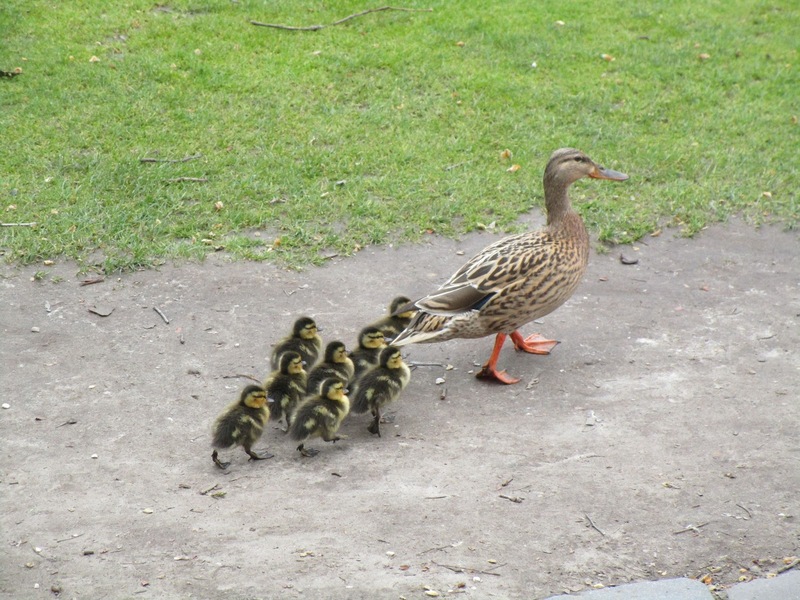 ), but really, what difference will one extra mother and daughter tagging along make? They'll barely notice us. Wrong! All parents potentially willing to fork out £37K a year on their daughter's education will be noticed. People have flown in from all corners of the globe for this Open Day. It's a v. big deal. As soon as we enter, my bobbly coat is whisked off me (in the end I’d decided the I'm-so-posh-I-can-be-scruffy look would be more convincing) and we are greeted with fresh coffee, still-warm Danish pastries, and programmes with our names on (sports fixtures in school today: showjumping and lacrosse). A pretty, skirt-suited woman, a member of the leadership team, bounces over to us. "Just act confident," I whisper to my daughter. "It's all about confidence." The woman introduces herself and reassures us that she has worked in prep schools for many years before coming here so she "knows where the girls are coming from". "What school do you go to now?" she asks my daughter. My daughter looks her straight in the eye and says the name of her bog-standard-state-school loudly and clearly. I see the woman flicking furiously through her mental files of prep schools. Nope, that one's not in there. She moves on quickly. "So, would you be a boarder or a day girl?" "Oh, definitely boarding!" says my daughter, beaming. (Impressive acting!) "Oh yes, boarding is great fun," says the woman. "Like a perpetual sleepover, right? The other day, the girls all took their duvets down to the den with hot chocolate and marshmallows and slept there all night!" she continues, feeding my daughter's fantasies. She takes us down Alice-in-Wonderland marble corridors and past a huge wood-panelled library with spiral staircases. "Wow, wow, wow!" my daughter and I mouth to each other with sneaky sideways glances. Her tour is interjected with bits of housekeeping information, like, "That's where you put your lac stick while you're in lessons". I nod, knowingly, as if lac is a word I bandy around a lot. I notice the door security code she presses to let us into the drama department is in roman numerals. (That should keep the riff-raff out.) She seems super-excited about using the lift to take us up to the theatre. "It's the only lift in the whole school," she tells us. "Everyone loves using it." I look at the buttons. There is only G, 1 and 2. "Erm, do you ever get to go out of the school?" I ask. "Yes!" she says. "Sometimes on a Saturday, Matron takes us to Waitrose." She escorts us to the astonishingly beautiful Assembly Hall with chandeliers, balconies and organ playing and we take our seats for an introductory talk and Q & A session with the Headteacher and senior teachers, a row of neat grey bobs and androgynous types in tracksuits. I get myself into slightly sticky waters when the couple next to me strike up a conversation. "It does make one reflect on one's own schooling, doesn't it? 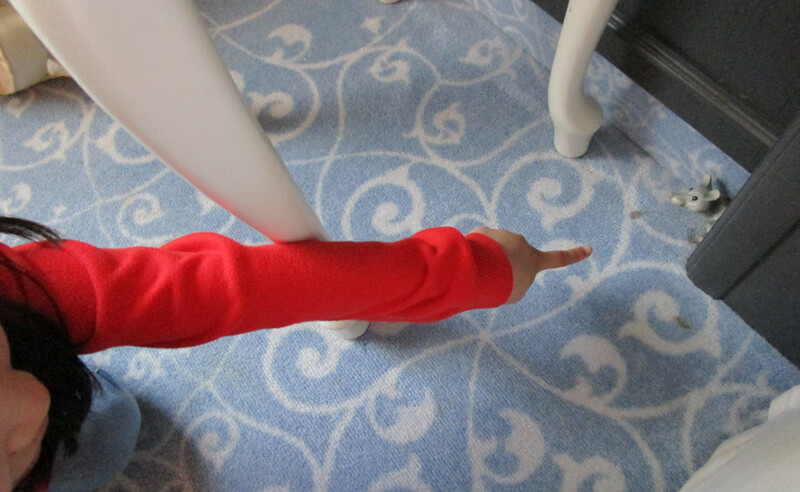 And whether you want the same or different for your own child." (Erm, yes, but not in the way you think). I bluff my way through with vague answers, reddening. I'm glad I put foundation on at least. The Head actually has a bun. And an ample bosom. Perfect. She's like a nice Miss Trunchbull and has a down-to-earth sense of humour. In answer to the question, "How do you keep the girls secure?" she replies, "Well, if I lose a girl, it's game over for me!" We're also reassured that House Mistresses keep an eye on the girls' table manners. She tells us that she went to this school herself. Now she works here. This is her world. "The chance to go into town with Matron [not just Waitrose] when they get to Year 11 becomes a wonderful thing," she tells us, without a hint of irony. 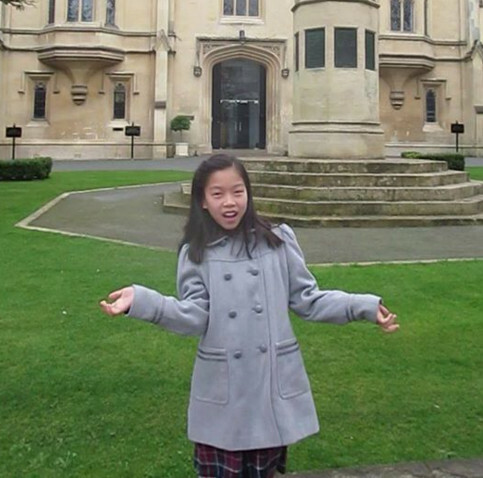 Next we are taken to a Boarding House by two pupils from China. It is modern. Smart. Comforting, if not exactly cosy. 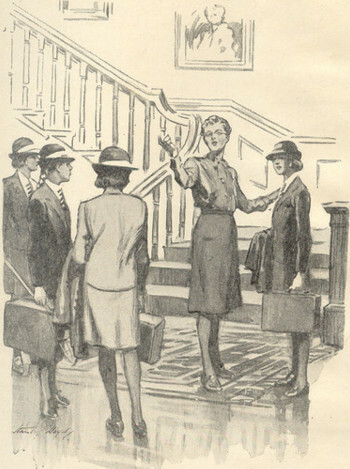 We are greeted by the House Mistress (who lives in an adjoining apartment with her cat) and shown around: Dorms, showers, prep room, dining room. There's also a common room on every floor with sofas, cushions, beanbags – and microwaves. For their Waitrose-bought snacks. Now, who says there's no such thing as a free lunch? It's fantastic. A choice of hot meals with a choice of hot side dishes, a salad bar, an assortment of fruit and desserts and cheese and crackers. We sit down with our trays and a group of five girls immediately join us. "Great food!" I say. "Yes," they agree. "Though you have to moan about school food. It's just what you do!" They seem eager to meet people from the outside world. Super-eager. They compete for my attention, talking over the top of each other, and I feel motherly towards them all. We're feeling really brave now and ask all the things we really want to know. Were you homesick? How often do you see your parents? Can you choose who you share a dorm with? Are you made to have a shower everyday? Do you have midnight feasts? They use words that are foreign to us like mufti and exeat and tell us the nitty-gritty details of their daily life: How their dirty laundry comes back to them washed, ironed and folded in their cubbyhole. How they have to do prep for an hour and a half every evening (though they're allowed to personalize their study booth). How you must walk to and from lessons with your Walking Buddy. How they get sanctions if they talk at night. And how they have to keep their mobile phone in a pigeon hole and are only allowed access to it twice a day (though one parent, they tell me with joyful horror, gave her daughter two phones, so she could secretly call her anytime). The chef rings a bell and two of them jump up like Pavlov's dogs. "That means seconds," they say. "Do you go to school with boys at your school now?" the others ask my daughter. She fends them off wonderfully. "Yes, but I wish I didn't. Boys can be soooo annoying." She's way better at this than me. "So what are you doing this afternoon?" I ask as we get up from the table. "We're going to Waitrose with Matron!" they answer. "Everyone seems really keen on Waitrose here," I say. "Why's that?" They look puzzled. "Well...it's really big," one of them ventures. "So what's on your shopping list today? I ask curiously. "Strawberries!" they say. I look round at the food counter. There is a big pile of strawberries ready for the taking. Clearly, the thrill of Waitrose isn't about the food. As we enter the outside world, I'm eager to know my daughter's opinion of the place. "It's a bit like a prison," she says. 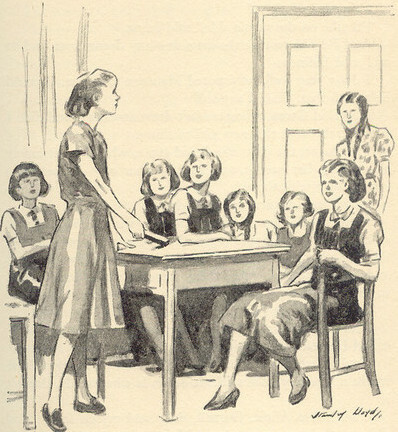 In Malory Towers, it always says things like 'Daryl nipped off to post a letter', but those girls are there 24/7 – apart from when they go to Waitrose." "That reminds me," I say. "We need to get a few things for dinner on the way home. Let's go to that Waitrose over there." "Urgghhhhh..." she groans. "Do we have to?" I'll be honest. The very words theme park make me lose the will to live. I picture myself trapped in a long, long queue, moving forwards inch-by-painful-inch, while being attacked by wasps, whingey kids and whiffs of hot-candy-dog-floss breath. But a niggly little voice in my head kept taunting me: What kind of parent are you? Your daughter's almost 11 and you're not going to take her to do that whole Disney make-magical-childhood-memories thing even once? 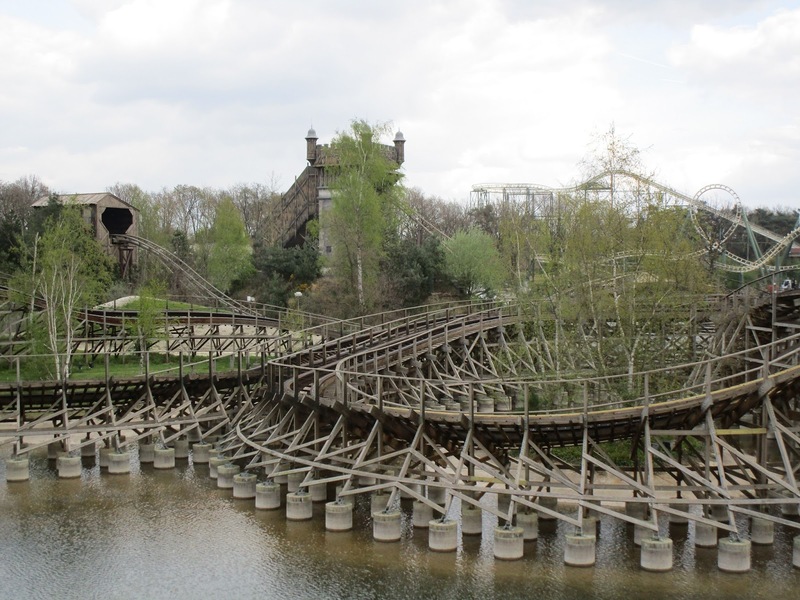 So when I heard about Efteling theme park in the Netherlands – sometimes nicknamed the 'Dutch Disneyland' – my ears pricked up. It sounded sort of different. Sort of classy. Enticing even. I decided to take the risk ... and I didn't regret it one bit. 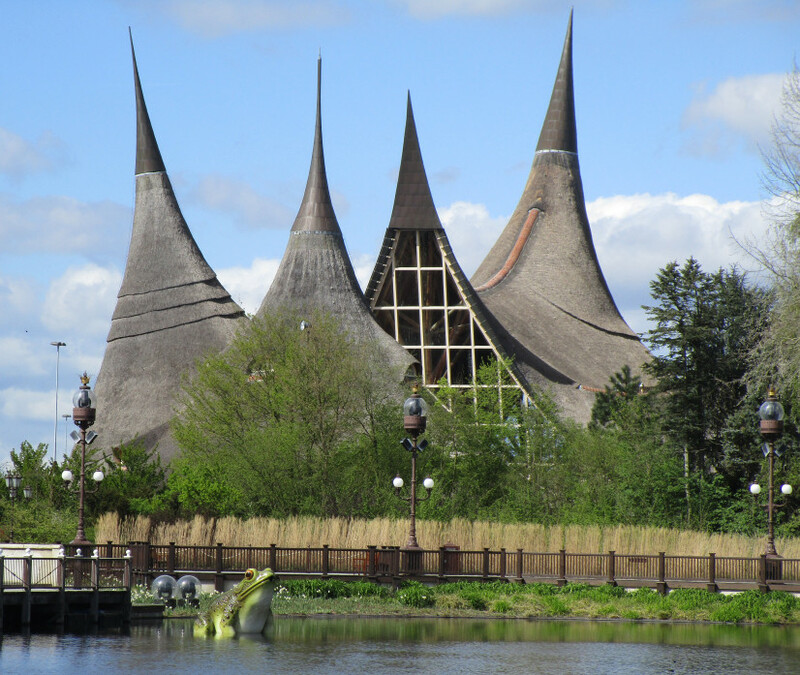 Here are 10 reasons to choose Efteling as an alternative to Disneyland. 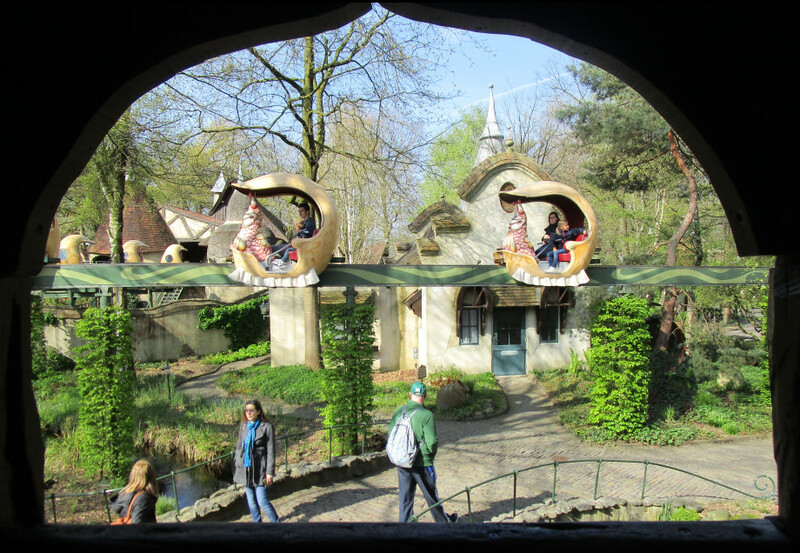 Efteling was originally designed in the 50s by Dutch artist Anton Pieck – and you can feel the love! 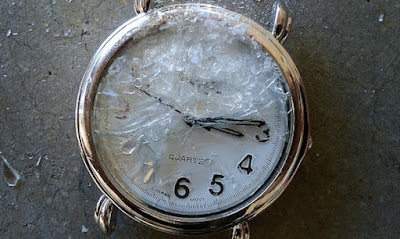 He insisted on using no concrete or plastic and paid incredible attention to detail. Even the bins are made of wicker baskets. It's a bit like taking a stroll through a beautifully mature park, brimming with lakes, trees, flowers and quirky buildings – that just happens to have incredible rides and attractions in every nook and cranny. I mean, you don't expect to see a little gang of ducklings waddling towards the Haunted House, do you? Make no mistake. This is a Full Size theme park, as big and exciting as you could wish for. Twice the size of Disneyland California in fact. 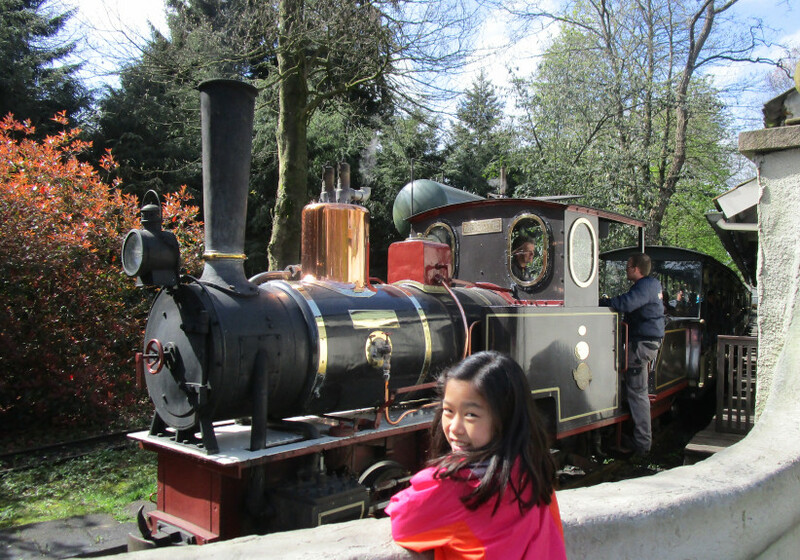 It's divided into four realms (Adventure, Fairy, Travel and Other) and to save your legs, a good-old fashioned stoomtrein runs around the whole park. 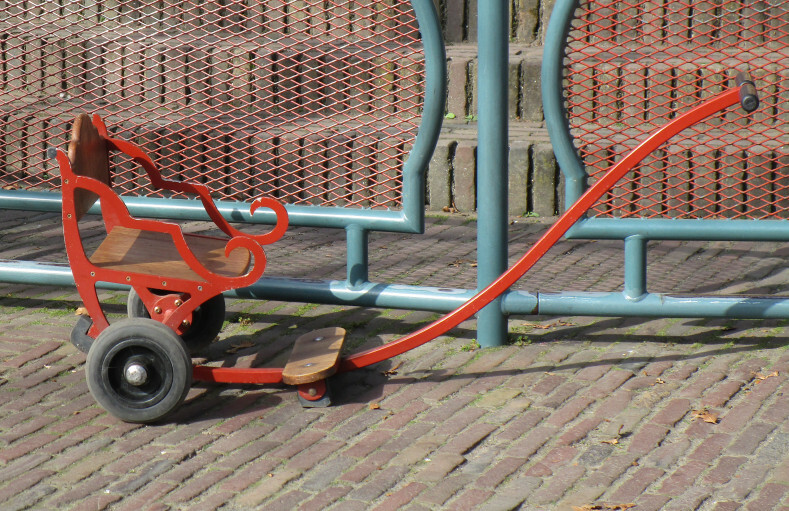 But when I saw how gorgeous these little wooden carts for children were, I was desperate to pull my daughter every step of the way. "Er...Hellooo?" she protested. "I'm like, eleven." Yes, Mickey Mouse, Dumbo and Disney Princesses are iconic, but any screen character is always going to feel a little superficial and commerical – especially when they're a human in a giant fluffy suit. 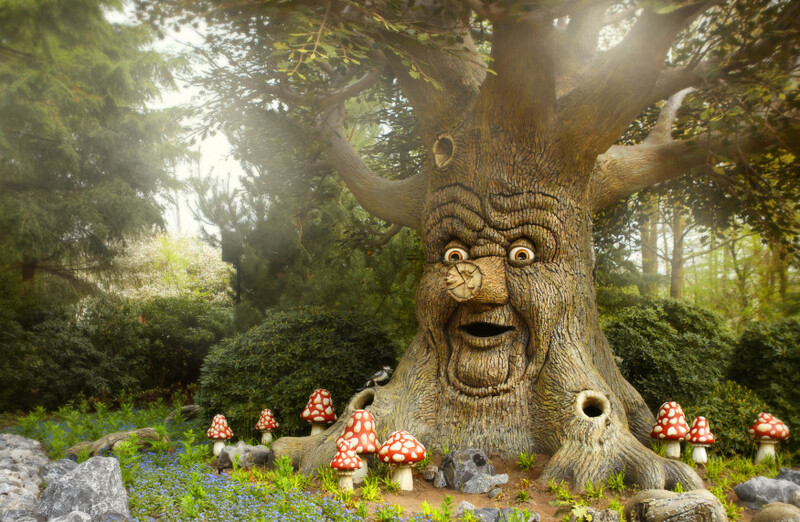 Efteling, by contrast, is themed around fairytale, folklore and legend which taps into something deeper and more magical. The Fairytale Forest was truly enchanting. We followed meandering paths through the trees stumbling upon life-size creations of fairy stories that made us gasp just a little bit. 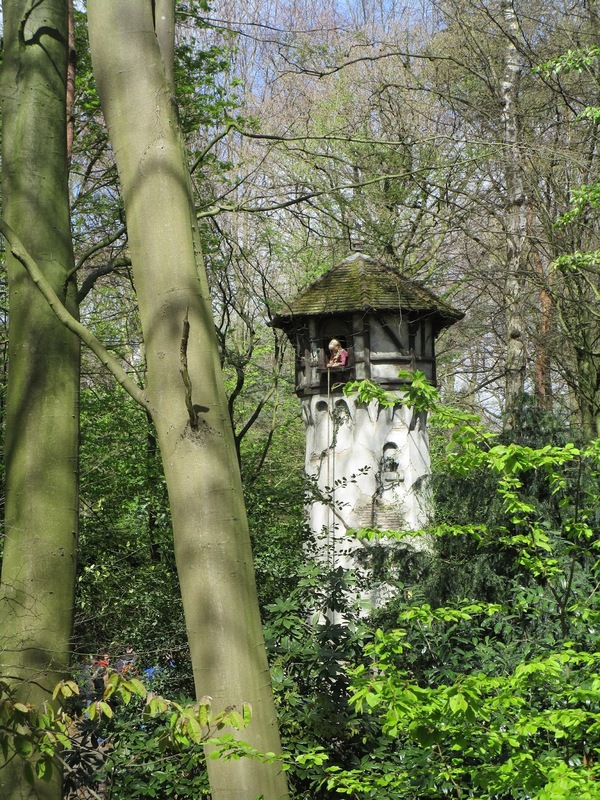 I got an extra surge of excitement when I glimpsed Rapunzel in her tower through the trees. It was like my favourite childhood Ladybird book in real life. You might think a theme park based on fairytale only has gentle, cutesy rides aimed at younger children. Wrong. There's a mind-blowing tangle of roller coasters. 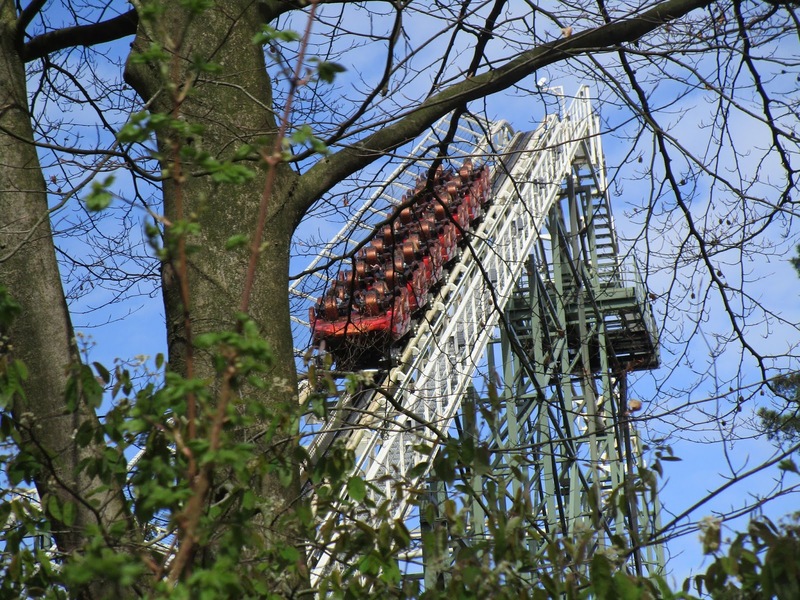 Like the one in darkness (Efteling's equivalent of Disney's Space Mountain), the one that flies off the track at the end and smashes you into water, the bobsleigh ride, and perhaps scariest of all, the one that plunges you vertically into a pit of steam – to the sound of angels singing! – and then immediately hauls you out upside down. Er, we gave that one a miss. The Dutch school holidays only overlap with the British ones so it is possible to visit at a time when the park is quiet. Really quiet. We went in the Easter holidays and waited in queues of 0 to10 minutes for each attraction. In two days we managed to do absolutely everything we wanted to do, everything we didn't think we wanted to do until we did it – and then do our favourites all over again. Isn't it odd how you take your kids to places for their enjoyment but have to pay more for your own entrance ticket than you do for theirs? Efteling doesn't do that. Adult and child tickets are the same price – about £32 for the day. For a family of four, that works out at almost half the price of Disneyland Paris. 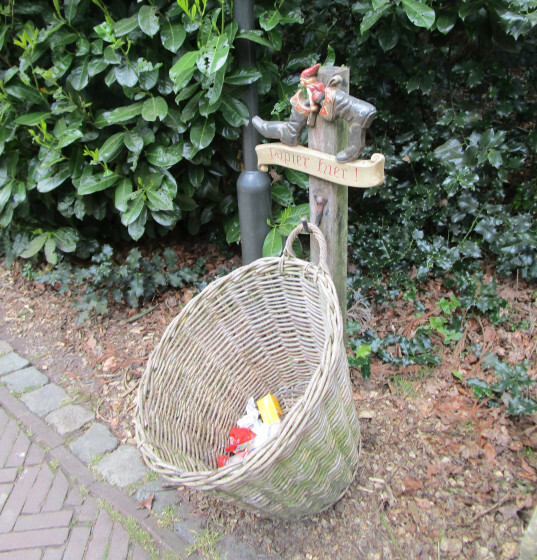 Nothing is in-your-face at Efteling, not even the souvenir shops and food outlets. Yes, you can buy a can of coke and a portion of chips (though you can eat them with mayonnaise the Dutch way). 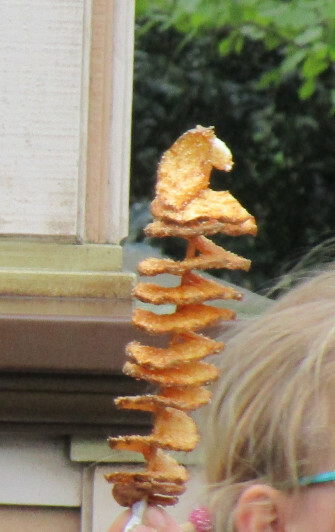 But you can can also buy more interesting things like Turkish pizza or these crunchy potato spirals on sticks, all at non-rip off prices. There are all kinds of restaurants too, whether you're after fish, vegetarian or a stack of Dutch pancakes, and they don't mind at all if you bring in your own picnic. We had to actually hunt out a souvenir shop before we left and I was surprised at how nice the stuff was. My daughter chose two jewels. 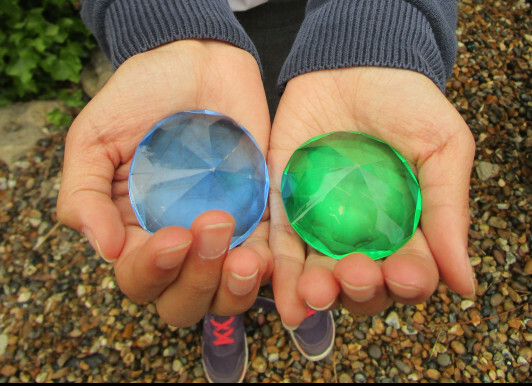 "They're magic stones," she said. "This one gives you the power of invisibility and this one gives you the power of flying." That's the spirit. 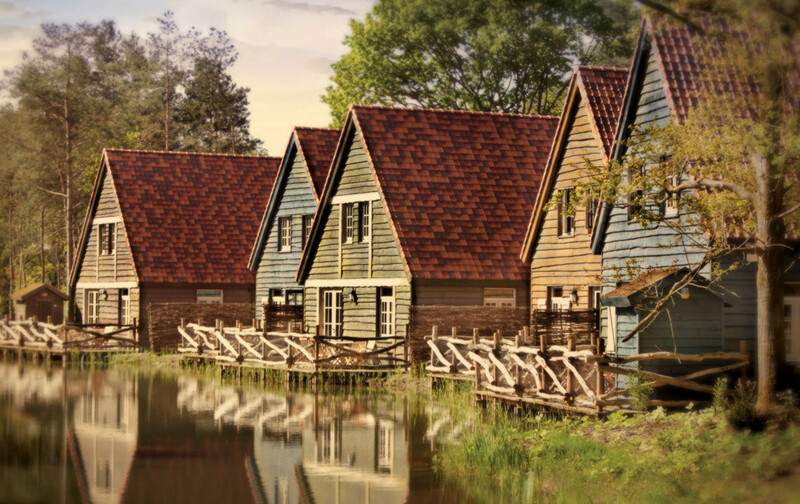 It was this picture of Efteling holiday village that first hooked me in. It looks like somewhere I might choose to stay with or without a theme park on the doorstep. 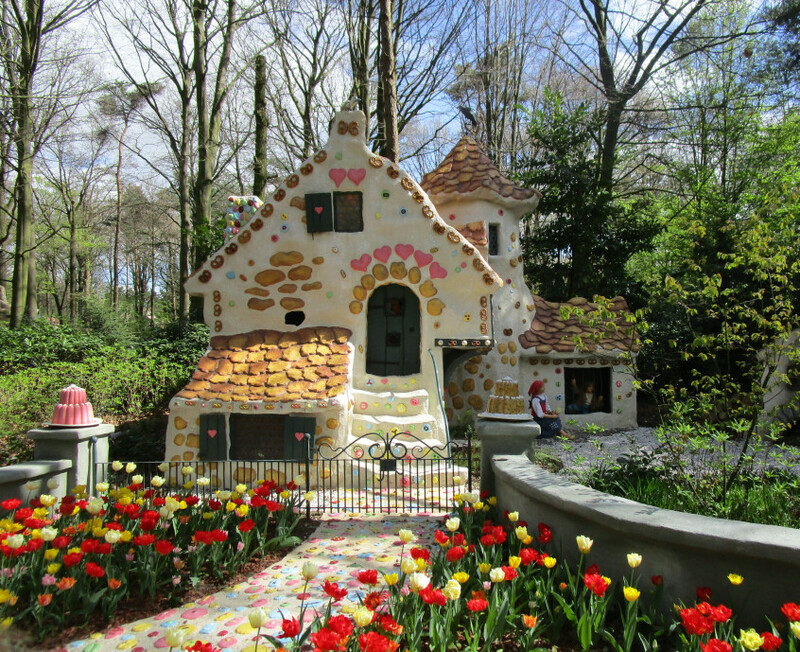 Efteling has two 'villages' snuggled in woodlands – one with undergound houses. 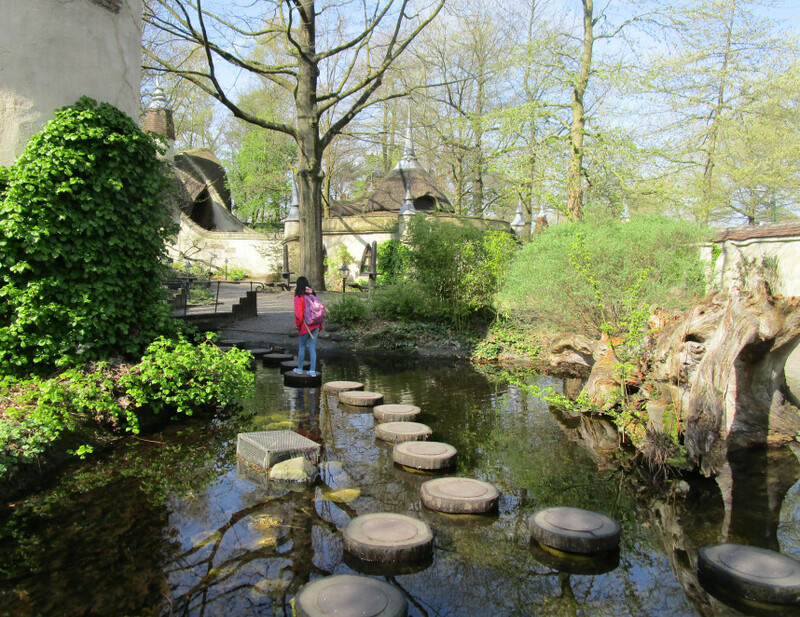 But we stayed at the Efteling Hotel with its moat and turrets just a few minutes walk away from the park. "Just follow the yellow footsteps!" smiled the receptionist and my daughter bounced out the door like she was off to see the wizard. 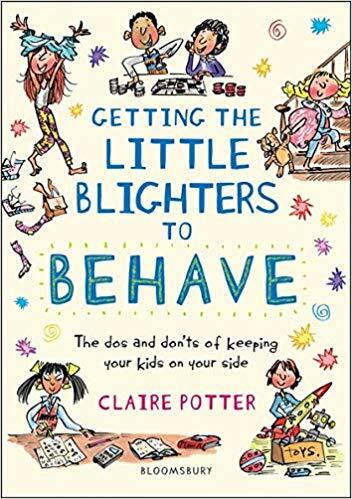 She loved discovering all the little details in our room like the bedside table in mid-air, the TV hidden behind an ornate sliding mirror and the mouse peeping out from the skirting board. Everyone seemed genuinely happy to work there. My daughter even commented on it. As a man helped her out of our boat onto a rotating platform after a ride through Dreamworld, she said, "He has to walk backwards in the dark all day and he's still in a good mood!" They all spoke really good English too. Some of the attractions in the park were based on Dutch stories unfamiliar to us, but that didn't detract from our pleasure. What's not to like about a pair of red shoes that dance through the streets on their own, or a monorail that travels through a village of gnomey people living in thatched hobbit houses? On one ride, the insanely disorientating Mad House ("Mum, are you going to just stare at your thighs the whole time?" Yep.) we had to listen to a wise old wizard tell a story in Dutch for about eight minutes first, but that didn't put my daughter off wanting to go on it again. 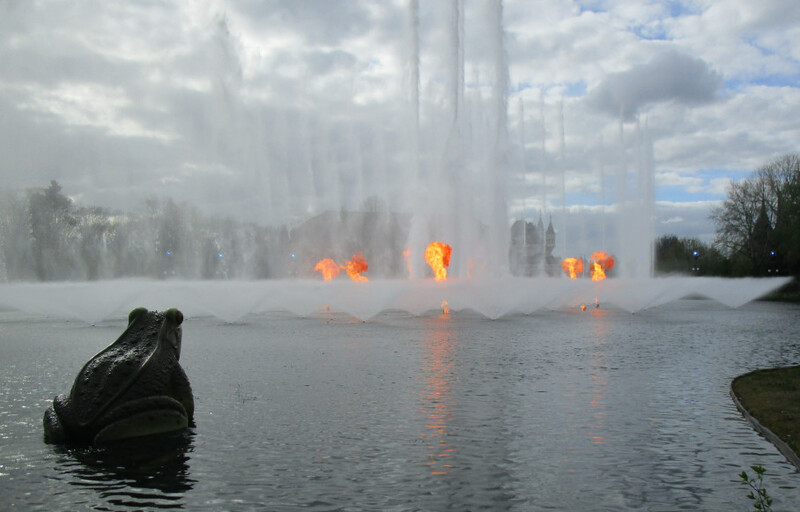 You can travel to Efteling easily from Amsterdam, Rotterdam or the nearest city, Eindhoven. 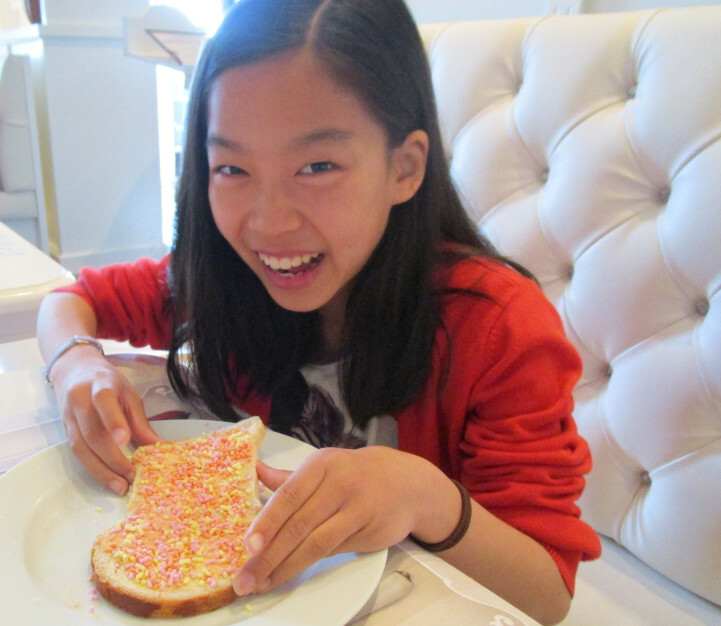 We flew to Eindhoven with Ryanair for pocket money prices and then took a (double decker!) train and a bus to the park. 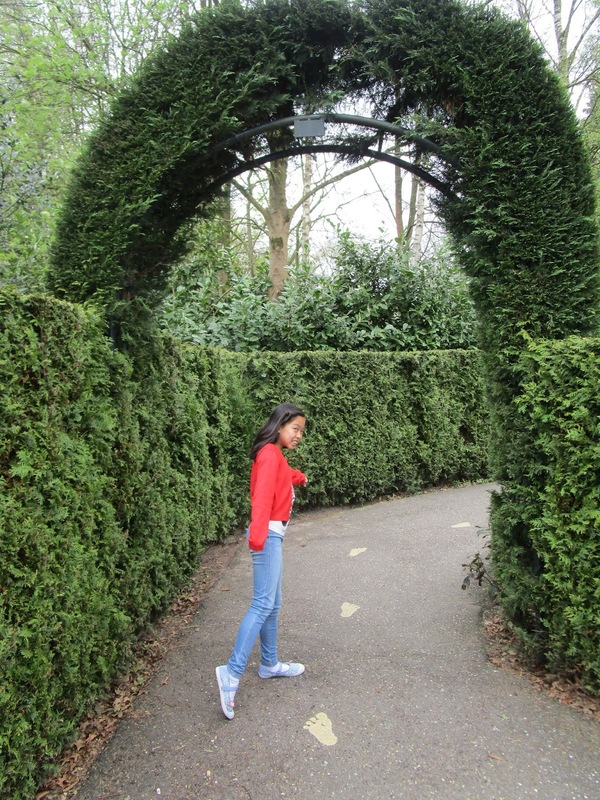 "You going to Efteling?" asked the bus driver. "Oh, I'm jealous. I went there so many times as a child, and I still love it." As we watched the spectacular light and fire show on the lake at the end of our last day, my daughter had one of those rare bursts of pure gratitude. "Thank you for bringing me here. It's awesome!" "That's okay," I said, mentally ticking the magical-childhood-memory box. "Shall we have a hot dog and a candyfloss for dinner?"